Google gets a lot of stick for its data collection practices, and that’s little surprise really. I love many of Google’s products, but that doesn’t stop me being concerned about just how precise a picture the company holds on me from all the data I’ve willingly handed over. And I’m by no means alone. 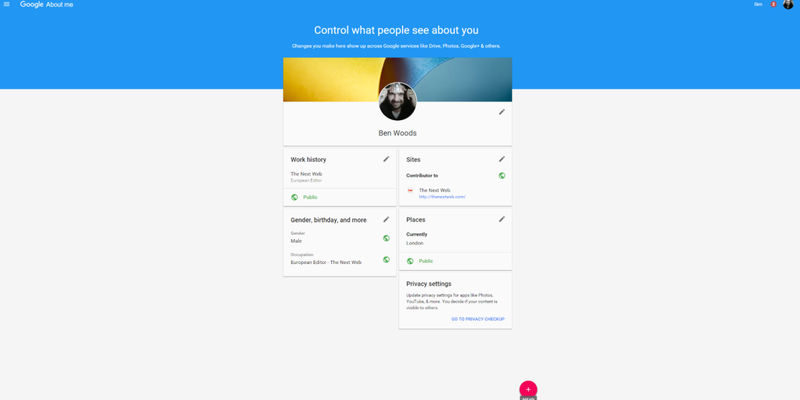 To redress this imbalance somewhat, Google has launched a tool called ‘About me’ that lets you view what data the company is holding on you that other people can see publicly online. You can then add or delete info as you see fit, up to a point. For example, you can’t change your first name or delete your birthday, but you can remove your surname or change your birthday details, if you’d like. Or if you’re the Queen and have two official birthdays but can’t remember which you use for official purposes. Google says that any changes you make will be reflected across all of its services, so the About Me page is supposed to act as a hub for your public-facing info. There’s an option that lets you view your info as an anonymous member of the public too, but it isn’t yet live.